President Xi Jinping greets Russian Foreign Minister Sergey Lavrov in the Great Hall of the People in Beijing on Tuesday. 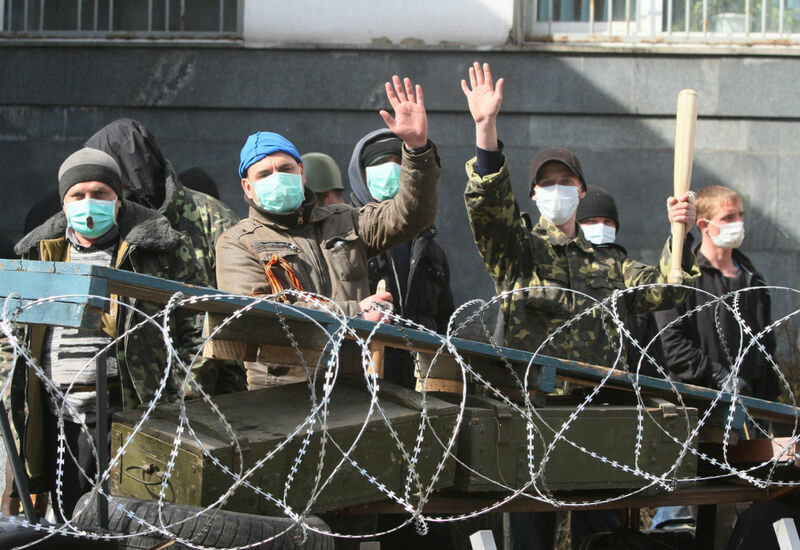 Beijing called on Tuesday for a "good environment" to resolve conflicts in Ukraine ahead of four-way crisis talks in Geneva, as tension escalated between Kiev and pro-Russian protesters. China welcomes Russia, the United States, the European Union and Ukraine establishing a dialogue process, but its success depends on guaranteeing the legitimate interests and concerns of all parties, Foreign Minister Wang Yi said after meeting with his Russian counterpart Sergey Lavrov in Beijing. President Xi Jinping, speaking after the two ministers met, called for stronger coordination on global and regional affairs between Beijing and Moscow. Xi told Lavrov that Sino-Russian ties, which have never been stronger, are important at a bilateral level and are playing an irreplaceable role in global peace and stability. Lavrov's one-day visit to Beijing came shortly before the scheduled talks in Geneva on Thursday among Russia, the US, the EU and Ukraine. China, as a friend of the Ukrainian people, does not want to see instability in the eastern European country, Wang said, adding that China would like to play a constructive role in any political resolution. 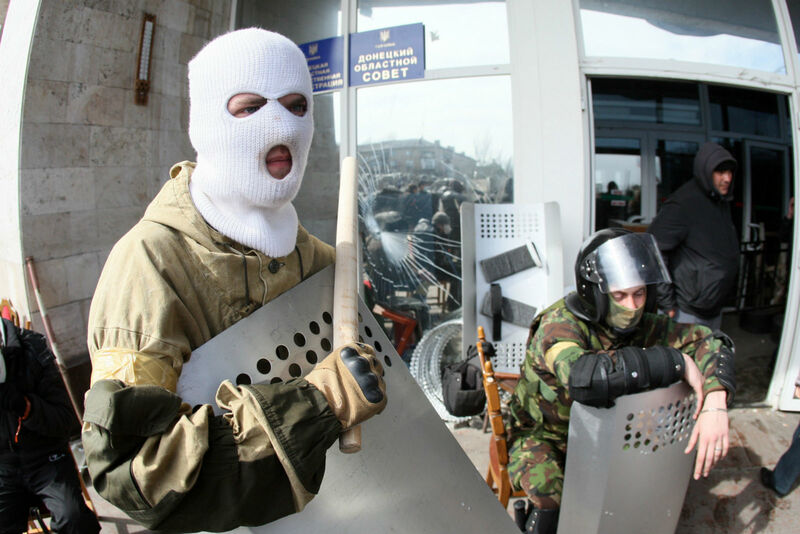 Kiev said an "anti-terrorist operation" against pro-Moscow protesters in the east of the country was underway. 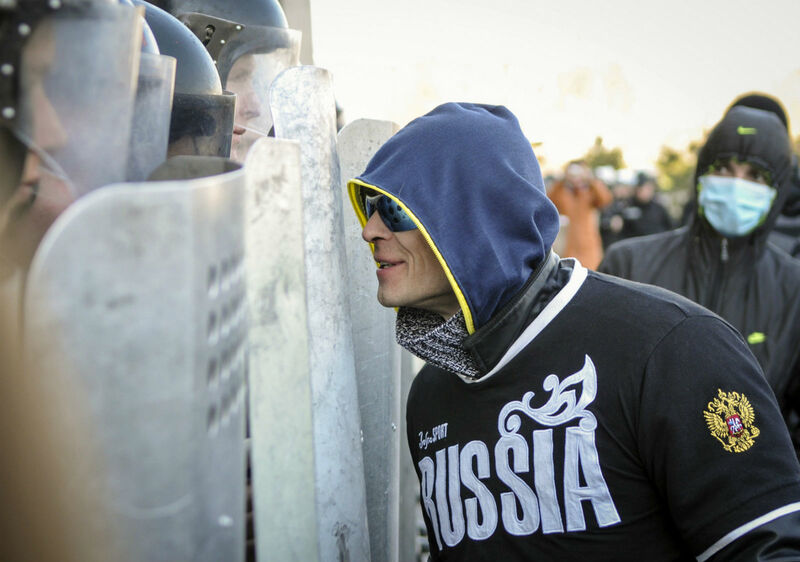 But there were no immediate signs that Kiev forces were ready to storm state buildings that have been occupied by protesters in the Russian-speaking east. Lavrov, speaking at a news conference in Beijing, warned Kiev against using force, saying the "criminal" act would undermine the talks planned for Geneva. "You can't send in tanks and at the same time hold talks, and the use of force would sabotage the opportunity offered by the four-party negotiations in Geneva," he said. Moscow "in principle" supports the "helpful" Geneva talks, but Kiev needs to conduct genuine constitutional reform, instead of merely doing things for show, he added. Lavrov told reporters that Russia "appreciates China's objective, balanced and responsible stance" on the Ukraine issue. Li Lifan, an expert on Russian studies at the Shanghai Academy of Social Sciences, said Kiev's "anti-terrorist operation" is unlikely to lead to large-scale conflict due to its limited armed forces and military options. "Kiev's interim government primarily aims to seek support from the West through such operations, but only negotiations can resolve the problems." Russian President Vladimir Putin is scheduled to attend a key Asian security conference in Shanghai next month. His visit is expected to come shortly after China and Russia wrap up 10 years of negotiations on Russian gas supplies, Russian media reported after both countries seemed to have agreed on price. Li Jianmin, a researcher of Russian studies at the Chinese Academy of Social Sciences, said Russia needs to have greater energy cooperation with China due to sanctions from the West. 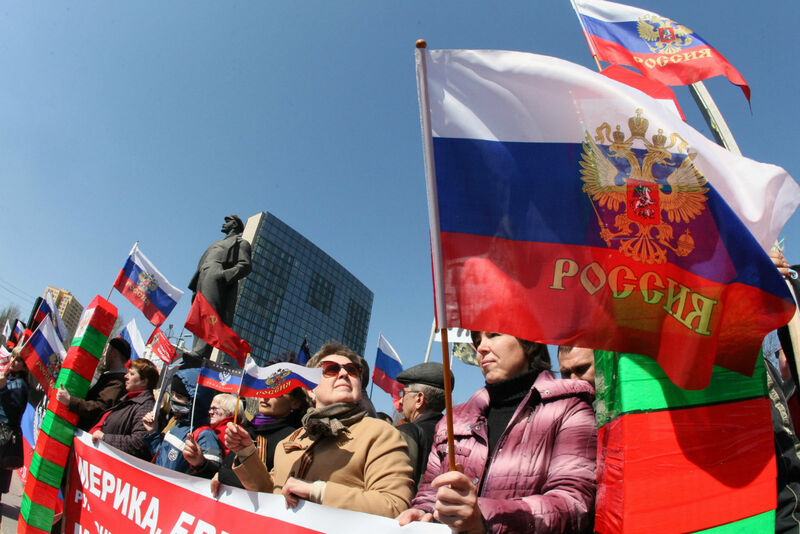 Pro-Russian protesters hold Russian national flags during a rally in Donetsk. 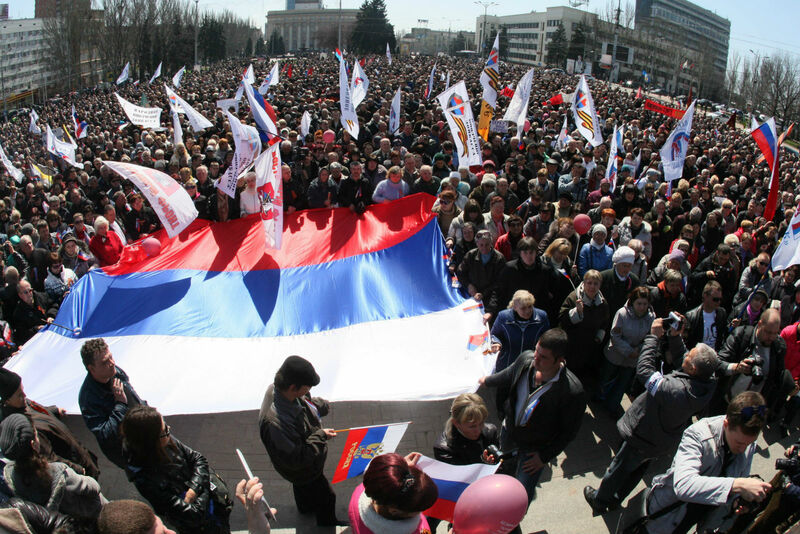 Pro-Russian protesters hold a huge Russian flag during a rally in Donetsk. 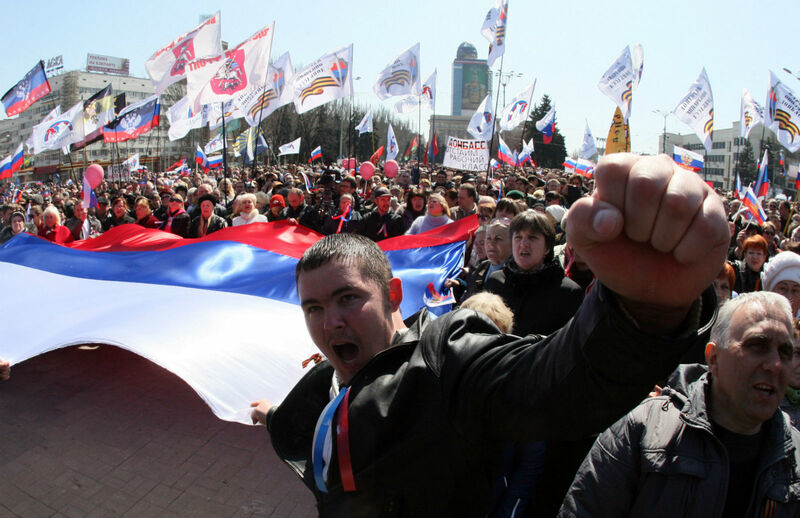 Pro-Russian protesters hold Russian flags during a rally in Donetsk. 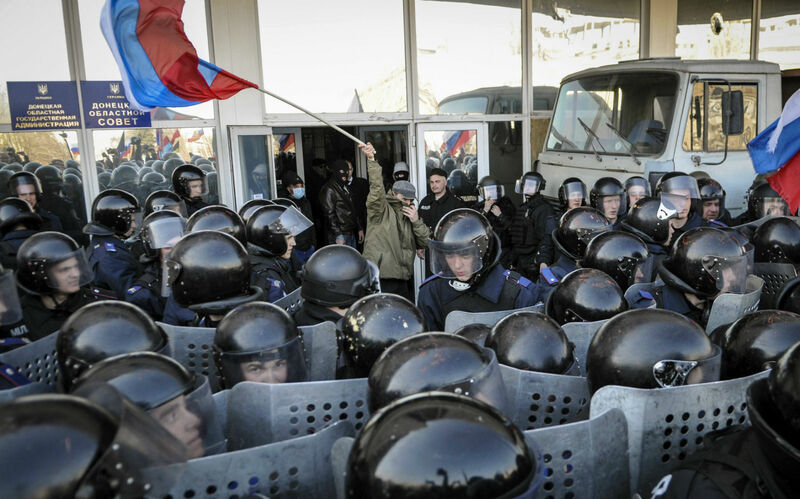 Pro-Russia protesters take part in a rally in front of the regional government building in Donetsk. 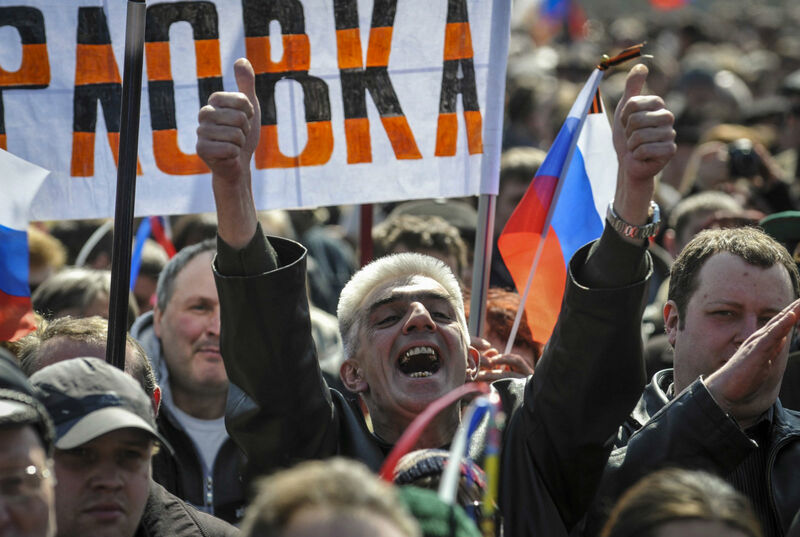 A man shouts during a pro-Russia rally near the regional government building in Donetsk. 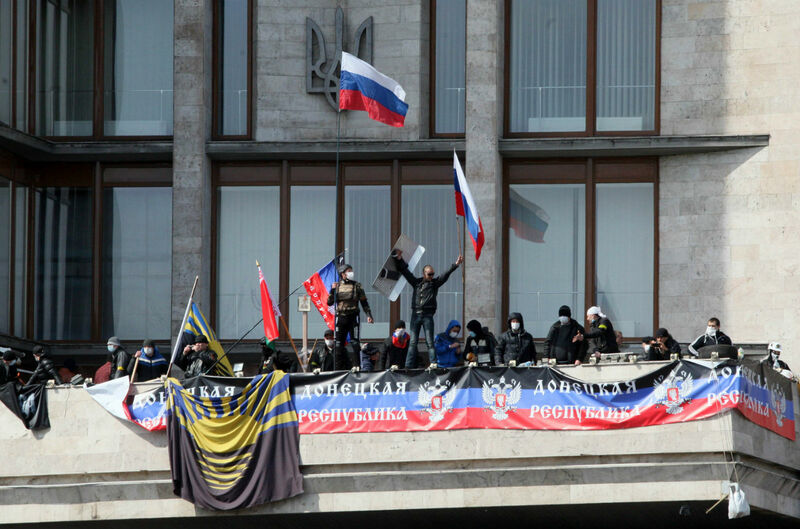 Pro-Russian supporters wave a Russian flag as they storm the regional administration building in Donetsk. 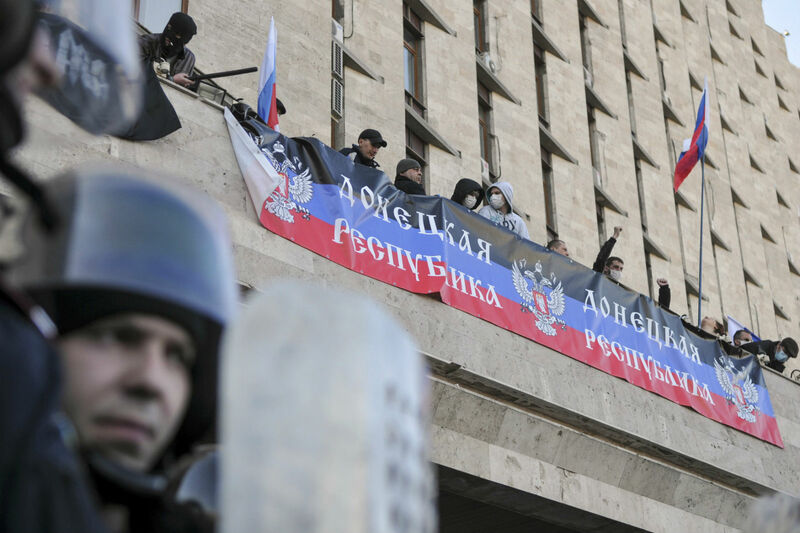 Pro-Russian protesters stand behind a banner as they storm the regional government building in Donetsk. 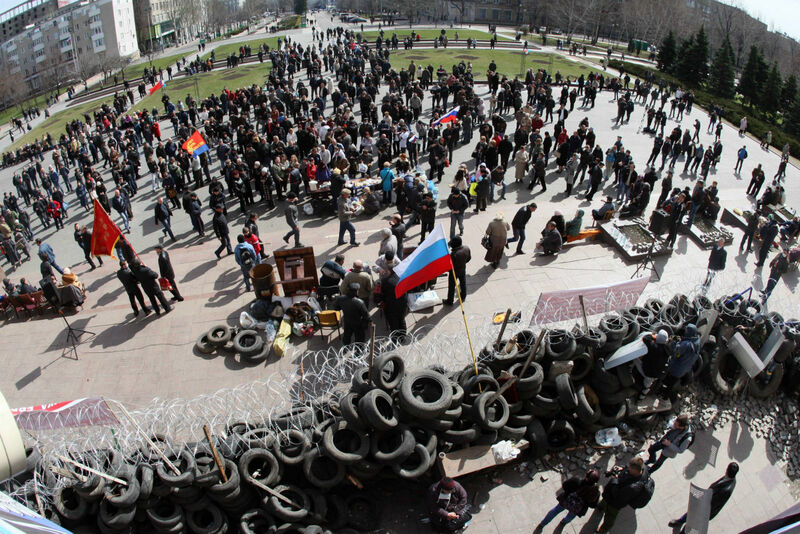 Around 100 pro-Russian protesters stormed the regional government building in the eastern Ukrainian city of Donetsk on Sunday. 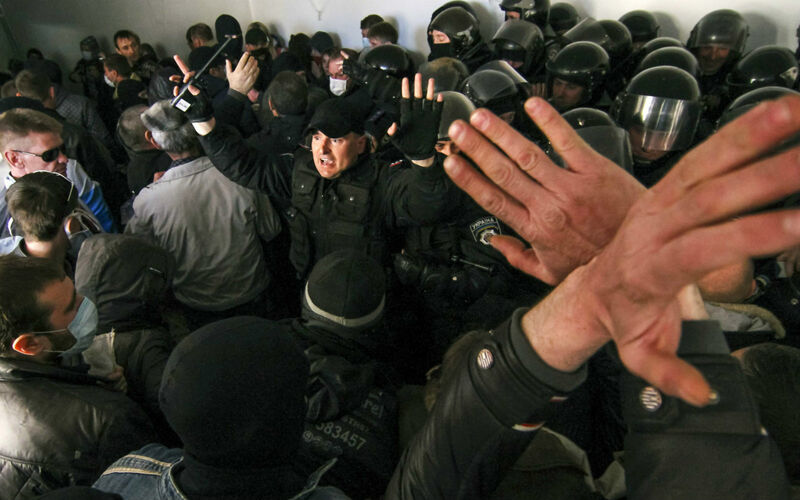 A police officer shouts as pro-Russia protesters storm the regional government building in Donetsk April 6, 2014. 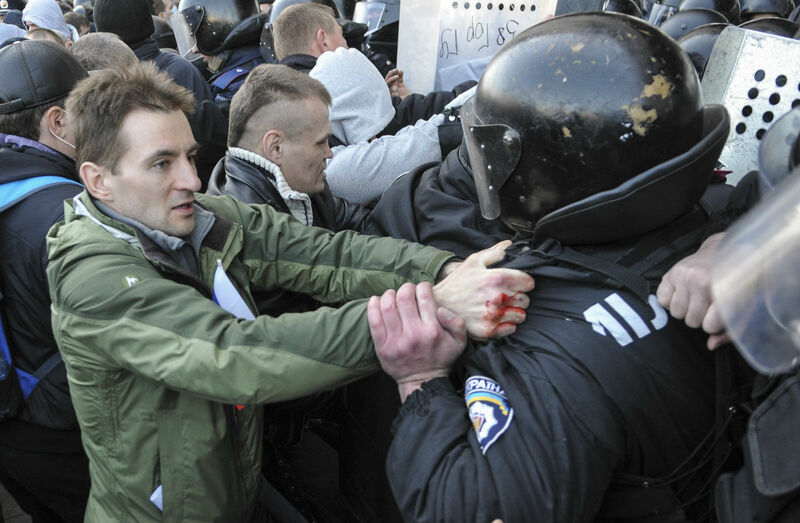 A pro-Russian protester argues with policemen near the regional government building in Donetsk. 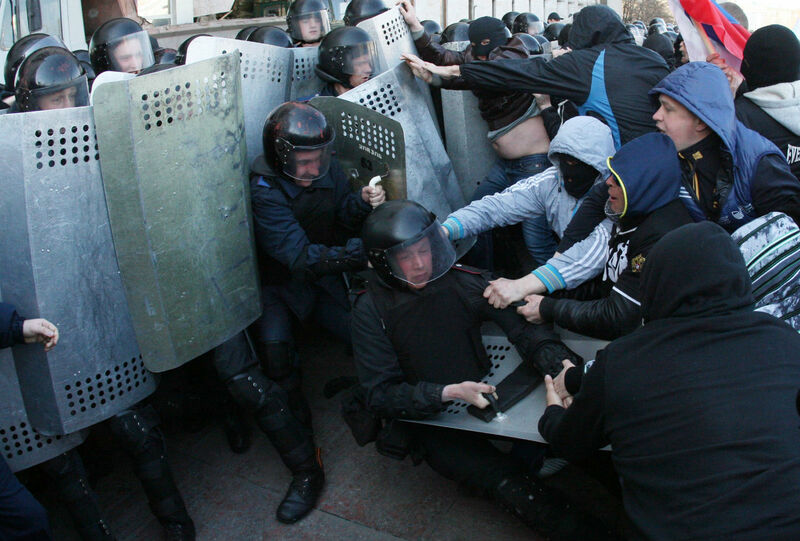 Pro-Russian protesters scuffle with the police near the regional government building in Donetsk. 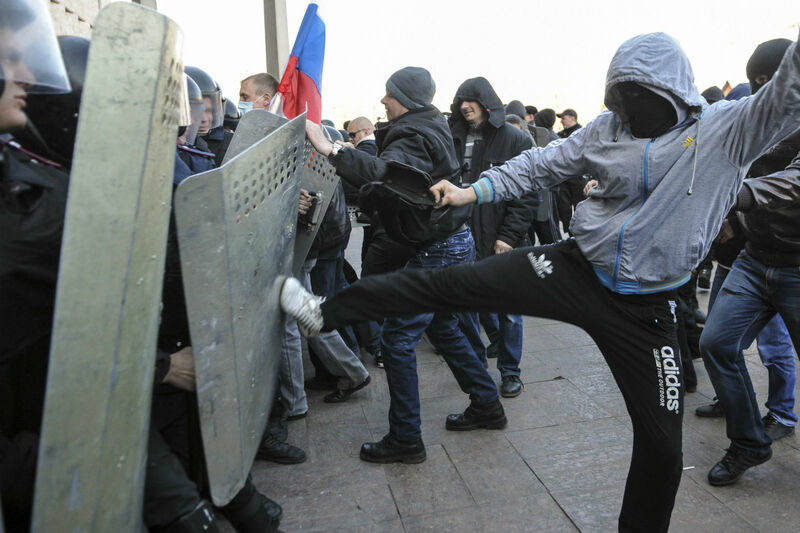 Pro-Russian activists scuffle with police near the regional government building in Donetsk. 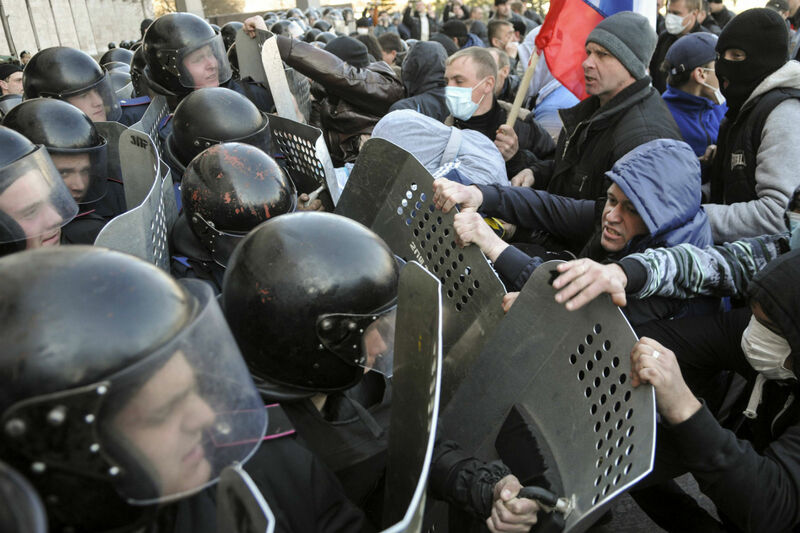 Pro-Russian supporters clash with members of the riot police as they storm the regional administration building in Donetsk. 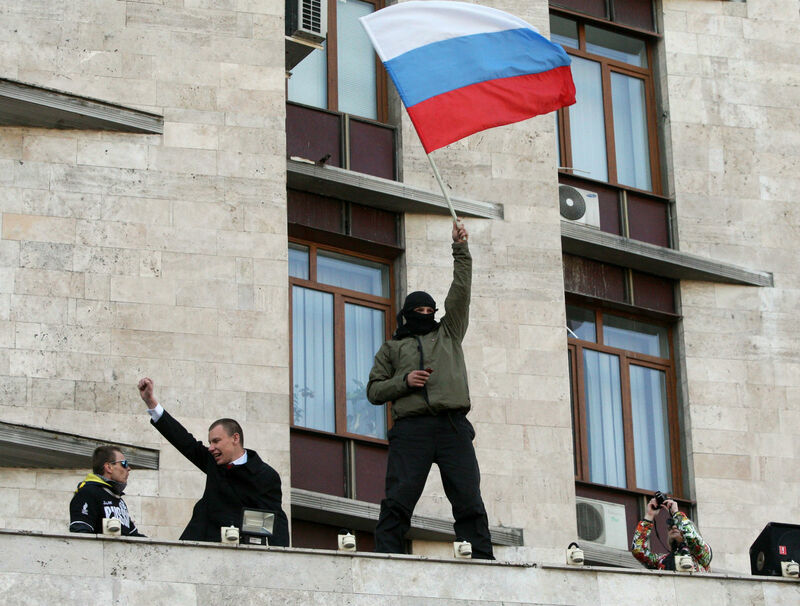 A pro-Russian protester waves a Russian flag behind policemen near the regional government building in Donetsk. 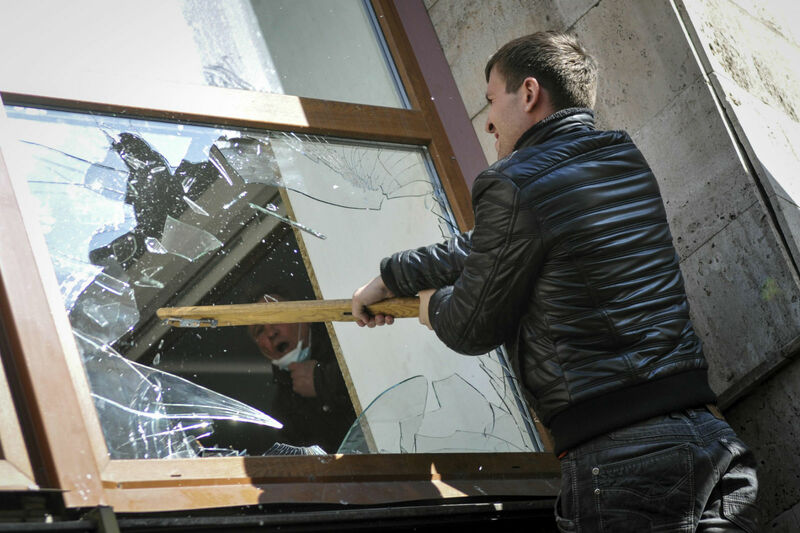 A pro-Russian protester breaks a window as they storm the regional government building in Donetsk. 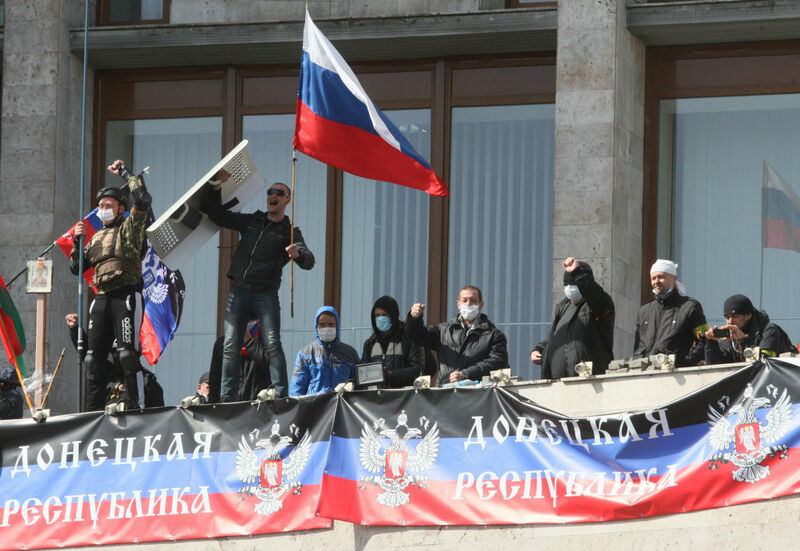 Pro-Russian activists who seized the main administration building in the eastern Ukrainian city of Donetsk deploy a flag of the so-called Donetsk Republic. 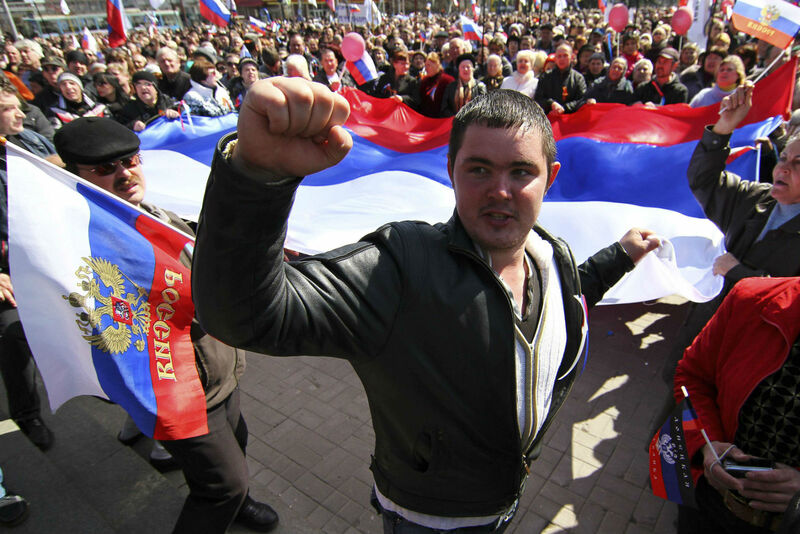 Pro-Russian activists proclaimed on April 7 the creation of a sovereign "people's republic" independent of Kiev's rule. Ukraine's embattled Prime Minister on April 7 accused Russia of trying to "dismember" his country by plotting seizures of government buildings in eastern regions that are seeking to break away from Kiev. 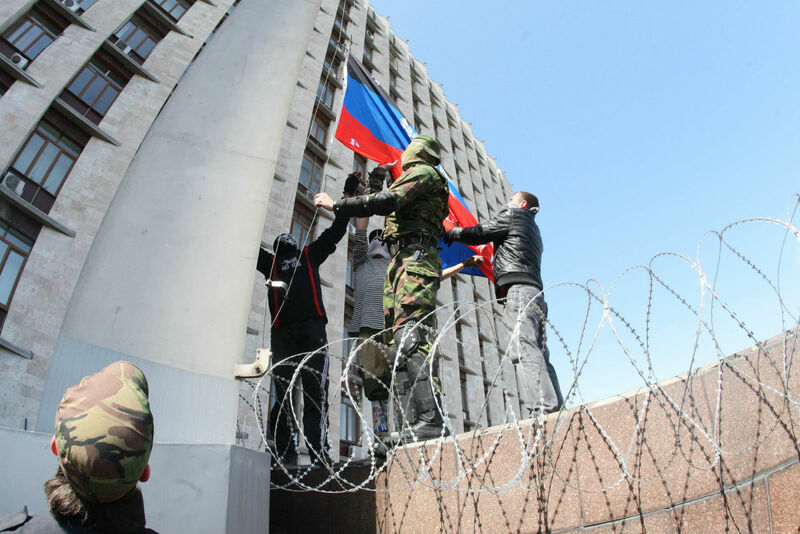 Pro-Russian activists guard the main administration building in Donetsk. 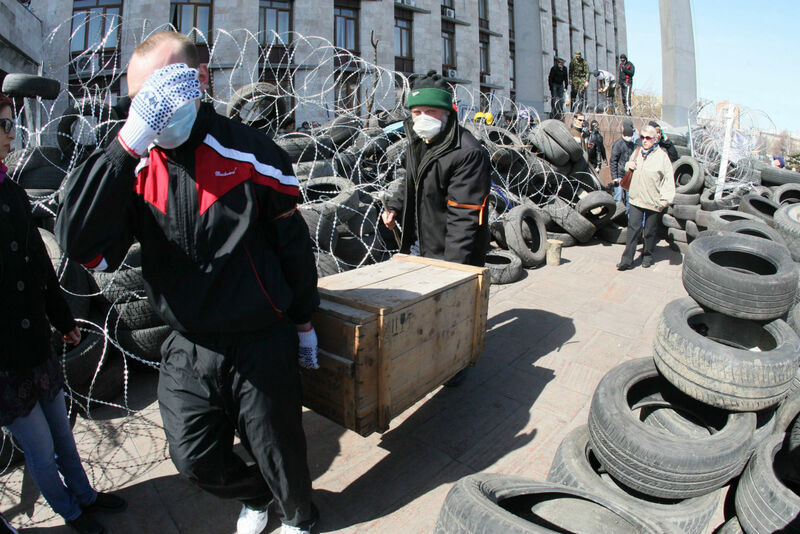 Pro-Russian activists who seized the main administration building in Donetsk carry a box among barricades made of tyres. 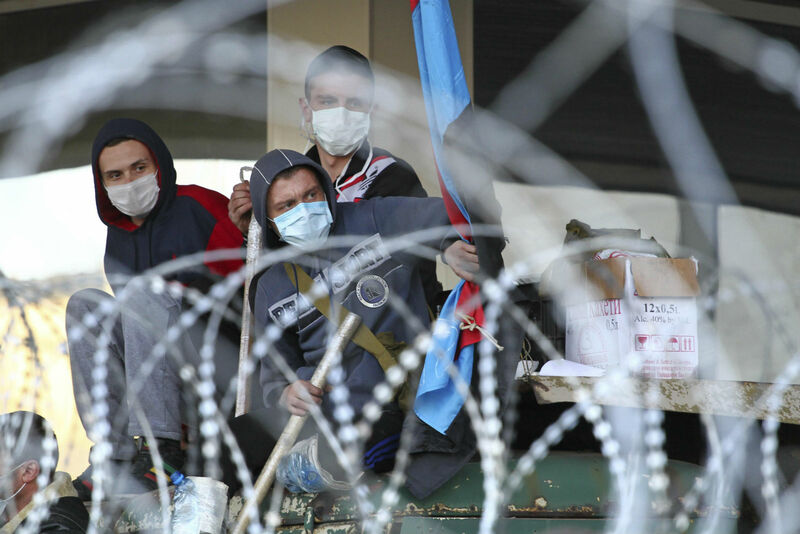 Pro-Russian protesters are seen through barbed wires at a barricade outside a regional government building. 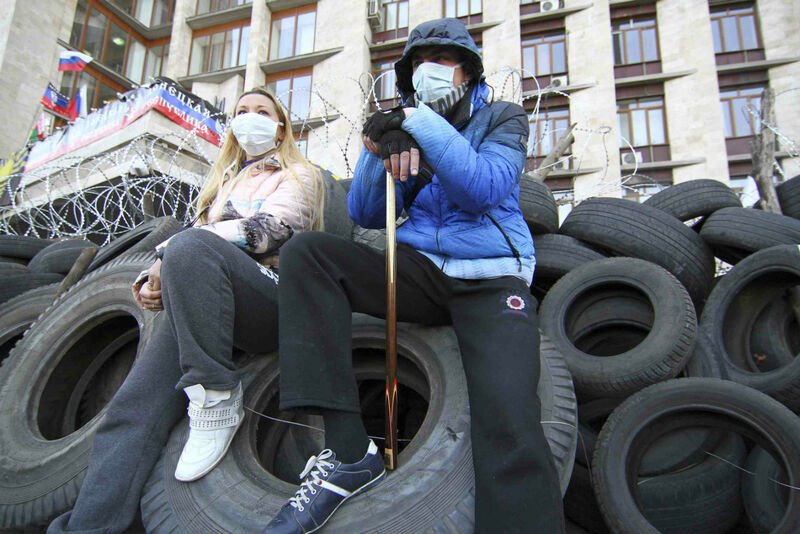 Pro-Russian protesters sit on automobile tyres outside a regional government building. 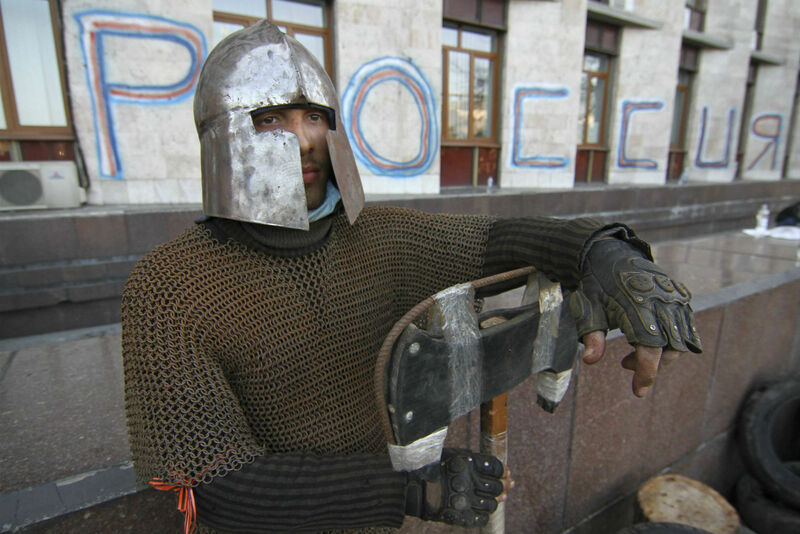 A man is seen wearing medieval armour as pro-Russian protesters gather outside a regional government building in Donetsk. 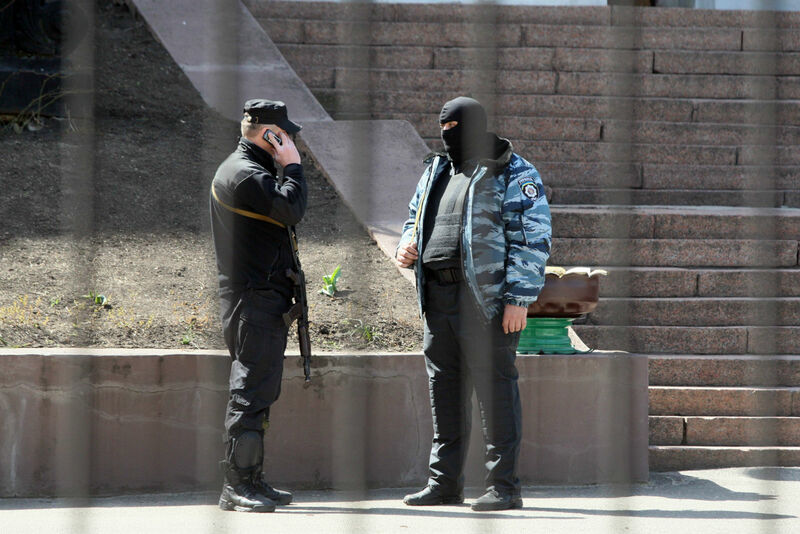 Policemen guard the state TV and radio company building in Donetsk. 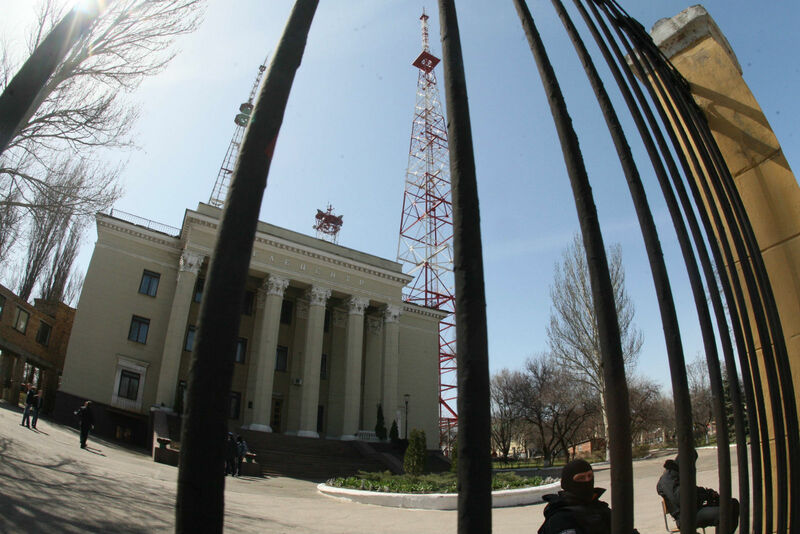 A policeman guards the state TV and radio company building in Donetsk. 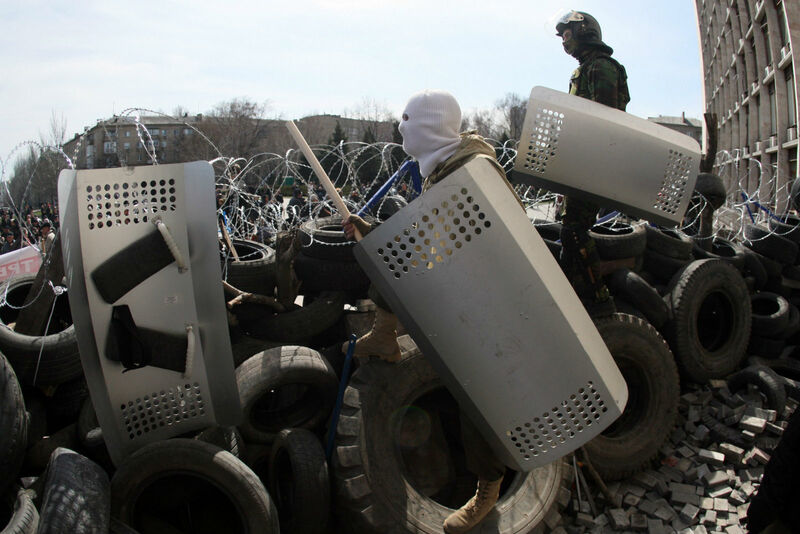 Pro-Russian activists guard a barricade set at the Ukrainian regional Security Service building in Donetsk. 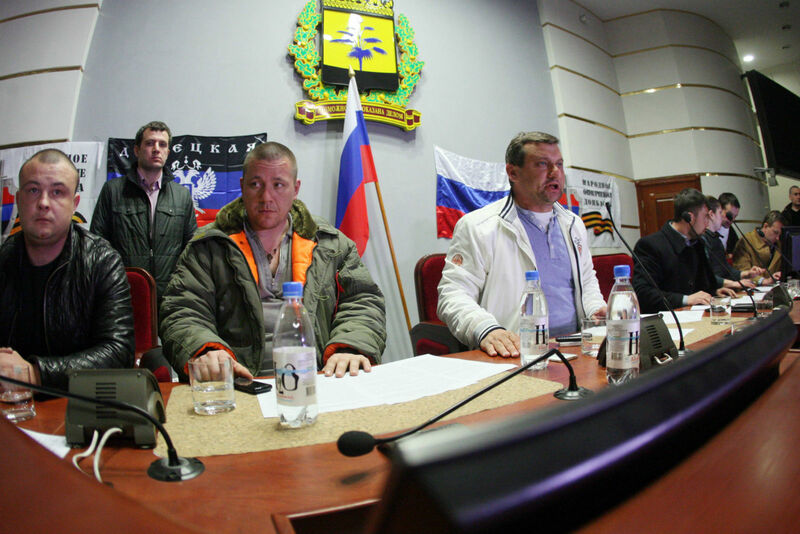 Pro-Russian activists who seized the main administration building in Donetsk take part in a meeting. 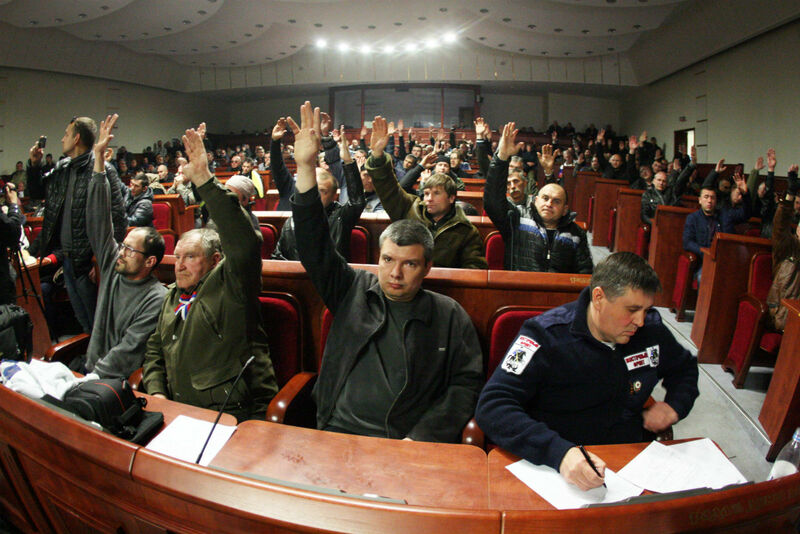 Pro-Russian activists who seized the main administration building in Donetsk vote on April 7, 2014, in Donetsk. 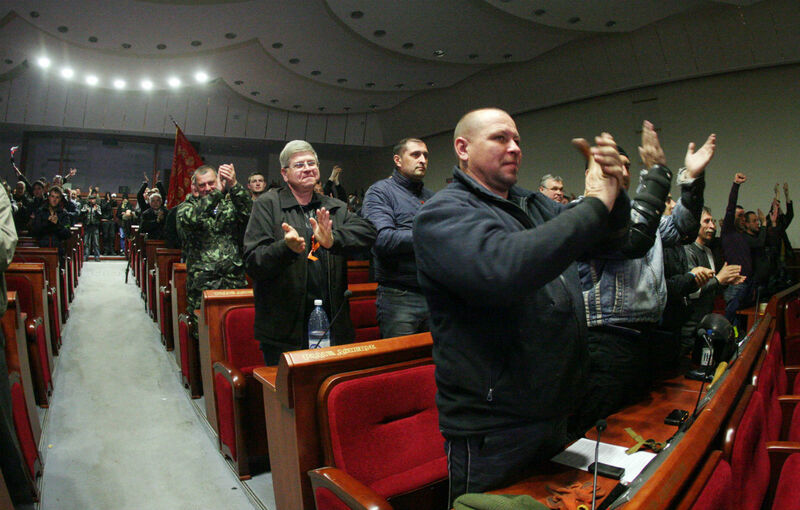 Pro-Russian activists who seized the main administration building in Donetsk applaud after the vote.